One of the best ways to improve your table tennis serves is solo practice. You get a box of balls and serve, serve, serve. I admit, this can be pretty boring. You need plenty of motivation to do this regularly. But if you can find the time and mental energy for some solo service practice, you can improve your serves a lot. When I attended the Werner Schlager Academy, I was struck by how many of the professionals were doing solo service practice. Before their main training session, they would spend 30-60 minutes just serving and serving and serving. Nothing else. Just serves. They were using this dedicated service practice time to perfect their existing serves and try out new things. In this blog post, I give advice on what you should (and shouldn’t do) during solo service practice and share some training drills to help you keep motivated. Let’s look at three things you should do when practising your serves. The temptation is to have three or four balls in your hand, so you don’t have to keep picking up a new ball for each serve. But when you hold a few balls in your hand, the toss will be slightly different compared to if you had one ball. In a match, you have one ball in your hand. You want your service practice to replicate a real match as closely as possible. So only serve with one ball in your hand. 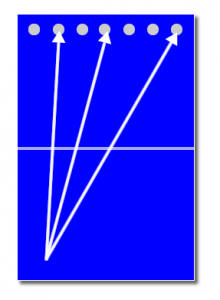 The toss will then be exactly the same as when you serve in a match. It’s quite easy to get into a rhythm of serve, pick up new ball, serve, pick up new ball and not complete the full service action (I am guilty of doing this). Instead, you should serve, recover to ready position, as though you had an opponent to return the ball. This is the full service action. You can even shadow play the third ball if you want to. In a match you wouldn’t serve and just stop, so you shouldn’t in solo service practice either. 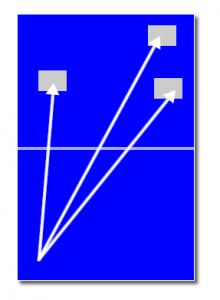 Serve, recover to ready position, shadow play third ball (optional). If you have rituals before you serve in a match, do the same during solo practice. If you take your time whilst serving during a match, do the same during solo practice. If you serve quickly during matches to unsettle your opponent, do the same during solo practice. You get the idea. Try to keep the tempo of your solo practice the same as matches. The closer you can replicate a match situation, the more beneficial your solo practice will be. The main purpose of solo service practice is to improve the quality of your serves. Better placement – Serve to different positions on the table and different lengths. 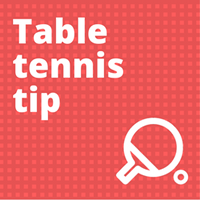 Extra spin – Try to increase your racket speed (whilst brushing the ball) to generate more spin. Variation – Try to keep the same service action, but vary the contact to produce spin variation. 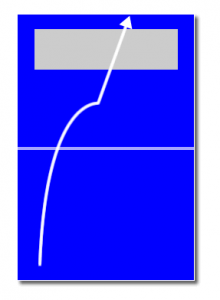 Serve height – Keep your serves as low over the net as you can. Consistency – When you try new things (like any of the above), you will make mistakes to begin with. But ultimately you are aiming for high consistency. You want good quality serves, which you can execute again and again and again. You don’t necessarily have to focus on all of these things at the same time during solo service practice. Just picking one or two things can be beneficial as you can really focus on the particular thing you want to improve. So you might just focus on getting extra spin in your first session. Then in the next session, you might focus on getting extra spin and improving the placement. Then in the next session, your focus might be on spin variation. The choice is yours. How long should you practice serves? Any time you can make for solo service practice is better than none. The longer you spend practising your serves (e.g. 30-60 mins), the more you’ll improve. But I am realistic. You probably do not have this much time to dedicate to solo service practice. Work, family and other commitments take up most of your time. Any time you do have for table tennis, you probably just want to play, rather than practice serves. I understand this, because I feel the same way! But (there is always a ‘but’), if you can find some time for some solo service practice, you will improve your serves. Just a few minutes a week can make a difference. How many serves should you practise? The number of serves you practise really depends on how long your session is. If you only have a short amount of time (5-10 mins), just focus on one or two serves. If you have a longer amount of time, then you can focus on more serves. Basically, you want to avoid doing loads of different serves in a short period of time, as you won’t improve anything. You’ll get the biggest improvement by focusing on less serves, but doing them really well. Serves can get better if you practise, but they can also get worse if you never practise. Even if your serves get really good, it doesn’t mean you should stop practising. You might not need to practise quite as much as before (when you were developing your serves to get to a high standard), but you need to keep on practising to keep them at a high standard. I think this is tough. Mainly because it is quite boring! I would much prefer to play table tennis with someone (by a million percent), than practise serves by myself. You do the same serve to the same target, 10 times in a row. Use a sheet of paper as target. You can fold the paper to make the target smaller. You should feel pressure increasing as you approach 10 in a row. This is good way of doing your serve whilst under pressure (like in a match). Put plastic cups at end of the table and try to knock them off. This helps you focus on length of your serve. To make it harder you can use smaller targets. I use broken balls, so my serve has to be more precise. Place a towel (or something similar) on the table. Leave a little space between the towel and end of the table. You aim is to get your first bounce before the towel and second bounce just after. This is a useful way to visualise where the ball should be bouncing to do a good half-long serve. 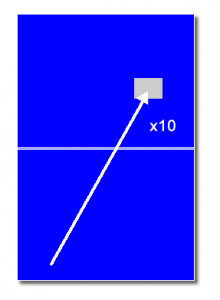 Put two or three different targets on the table. This could be a bit of paper or masking tape. You have to do the same serve but to these different positions. See how many times in a row you can hit each target (one after the other). Then see if you can beat your record. This is a good way of improving your service placement. This time you put five or six targets on the table. 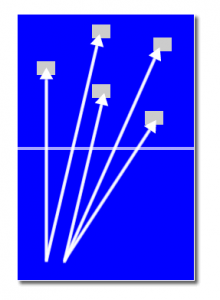 You have to hit the targets, but each time you change serve (choose two or three different serves). Again, see how many times in a row you can hit your targets and then try to beat your record. This is a good way to practise switching between serves, but maintain a high level of placement consistency. I hope I have convinced you that solo service practice is a good way to improve your serves. It can be boring, but it’s worth doing. The key point is to try and serve like you would in a match. So only one ball in your hand at a time and recover to your ready position after your serve. Focus on placement, spin, variation, keeping the ball low over the net and consistency. Any amount of time practising your serves (even a few minutes) is better than none, but the more you practise the better your serves will be. And if you’re struggling for motivation, try one of my exercises above. Yes! I do this too. It does make solo service practice less of a chore. Good suggestion. solo practice.It is boring.Sometimes I didn’t know what to do.But now after reading your article I hope I can improve my serves.I will spend more time for solo service practice.Thank you very much. It can be a bit boring, but you will defeinitely make your serves stronger. Just keep going!